This is a simple, moderately spiced dish of bhindi. Some people like bhindi, some don’t but I think this dish is worth giving a try. What I have found is that bhindi is liked by most kids so bhindi masala can be prepared quickly in the morning for lunch box. 1. Wash bhindi and let the excess water drain. Pat dry on a kitchen towel. Remove caps and tips of okra. 2. 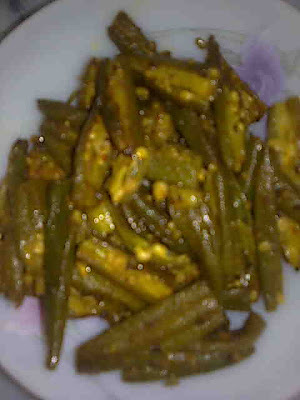 Cut bhindi lengthwise and cut horizontally into 1 1/2 inch pieces. 3. Heat oil in a pan or a karahi (heavy bottomed vessel) and add carom seeds. When they change color, add hing. 4. Add bhindi. Add salt, turmeric, coriander, red chilli and fennel powders. Mix well. Lower heat and cover the lid of the pan. 5. Cook on low heat till bhindi turns tender but hold its shape. Turn off heat and add amchoor. Serve hot bhindi masala with rotis or parathas.